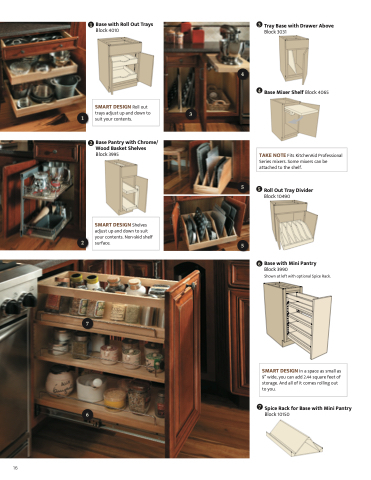 SMART DESIGN In a space as small as 9” wide, you can add 2.44 square feet of storage. And all of it comes rolling out to you. SMART DESIGN Roll out trays adjust up and down to suit your contents. SMART DESIGN Shelves adjust up and down to suit your contents. Non-skid shelf surface. TAKE NOTE Fits KitchenAid Professional Series mixers. Some mixers can be attached to the shelf. Shown at left with optional Spice Rack.